This city is 100 km west of Bangkok. Many tourists go to this area as a day trip from Bangkok or as a multi day round trip from Bangkok. The environment in Kanchanaburi full with beautiful nature with quite a few rivers, and pleasant river resorts. 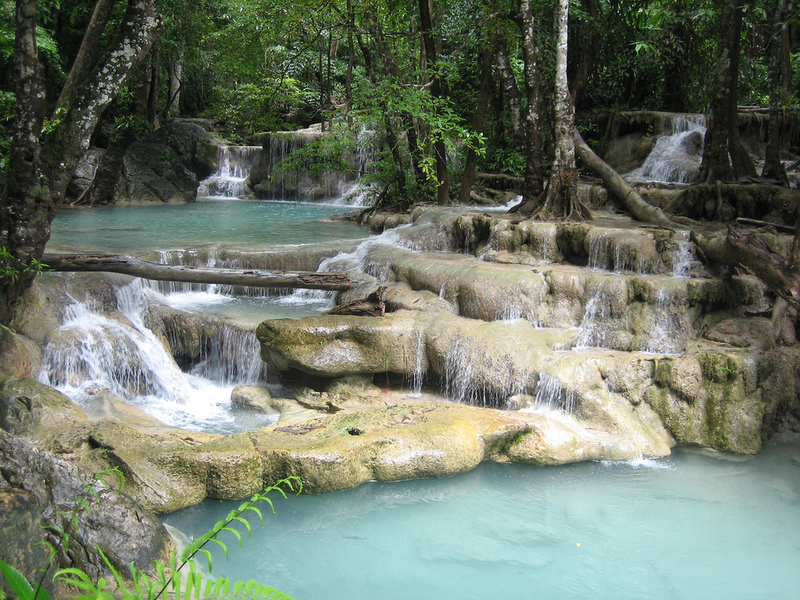 Approximately 65 km outside Kanchanaburi city is the Erawan National Park, famous for it’s waterfalls and natural fish spa’s. A good alternative for the Erawan Waterfalls are the Huai Mae Khamin Waterfalls. These are far less visited due to its more northern location. Around Kanchanaburi city are a few museums and memorial sites dedicated to the second world war. 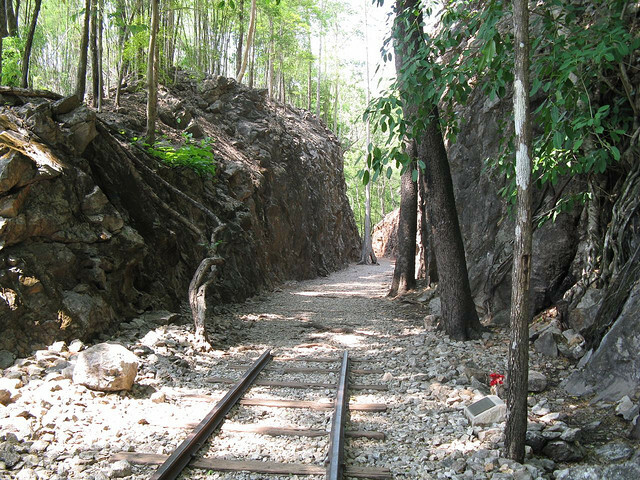 The Japanese army forced prisoners to construct a railway from Bangkok to Burma (Myanmar) trough this area. The railway is better known as the Burma railway or the railway of death. 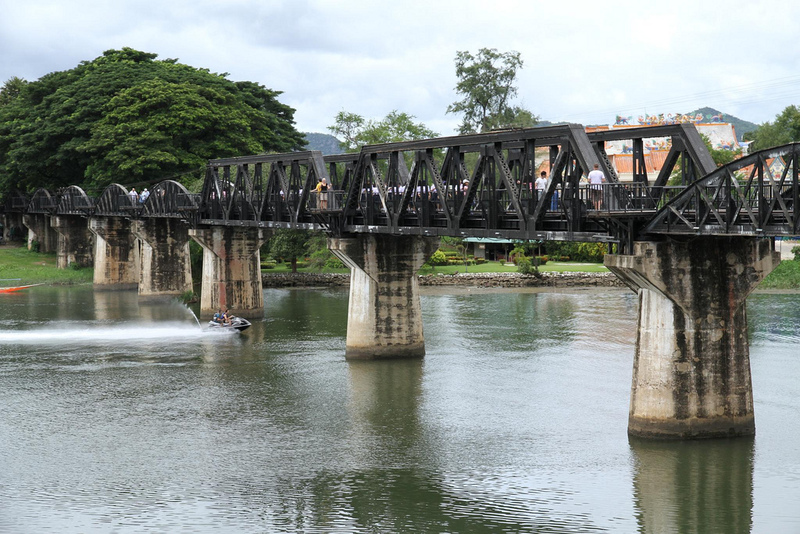 Most famous is the “bridge over the river Kwai”, known for the movie with the same name. Close by are the Allied War Cemeteries, The Hellfirepass and the JEATH war museum. In the North Western corner of Kanchanaburi is the Sangkhlaburi district. Here is the Khao Laem Reservoir. This is a lake that was formed after the construction of a dam in the Kwae Noi river (aka river kwai). The result was that entire villages and also ancient temples were flooded. North of the lake is the Three Pagodas Pass. This is a strategic border crossing point between Burma and Thailand. During wars between Siam (Former Thailand) and Burma this was used by invading armies from both sides. During the 2nd world war the Japanese build the Burma – Thailand railway over this border crossing point. Due to the remote location of Sangkhlaburi district it is not often visited by foreingers. A nice opportonity to see an authentic part of Thailand. The heavily criticized Tiger Temple is also in Kanchanaburi province. Animal right groups say that the tigers are abused and under the influence of calming drugs to keep them approachable for tourists. Close to the river Kwai noi is the Prasat Muang Singh temple complex. This was more than thousand years ago the most western outpost of the Khmer empire, nowadays Cambodia. There are several hot spring dotted across the province. The best known and most popular venues are Hin Dad Hot Spring and Wat Wang Khanai Hot Spring. Article on www.edition.cnn.com about the Hellfire Pass WW2 memorial museum. Travel report from: www.readme.me; Slowtopia : Once Upon a Time in Kanchanaburi.